On a Saturday this month, some 20 men and women stood behind pots and jars of homemade yoghurt at Tran’s pensioners’ club, awaiting the jury’s verdict on their concoctions. Every year in mid-July, the small town of Tran, huddled at the foot of the Balkan mountains near Bulgaria’s border with Serbia, celebrates the art of making yoghurt and commemorates the local scientist who discovered the bacterium that turns milk into its thickened sour form – a food seen as the pearl of Bulgarian gastronomic heritage. Oblivious to the speeches and folk dances on the main square, however, retired teacher Evgenia Dimitrova and her companions preferred to compete on who made the best goat’s, sheep’s, cow’s or buffalo’s milk yoghurt. “I keep my mother’s yoghurt starter culture, which she got from her mother,” said Ms Dimitrova who came from the nearby village of Lomnica. “I never forget to keep a spoonful of yoghurt to use as ferment for tomorrow’s milk,” she added. Ms Dimitrova’s original recipe for goat’s milk yoghurt with basil and thyme won the top prize in her category – amusingly, a basket of dairy products. Bulgaria prides itself on discovering yoghurt and has even given its name to the bacteria that makes it: Lactobacillus bulgaricus. “Set the milk to boil to kill the bad bacteria. When it turns lukewarm, add a spoonful of yoghurt, stir and close the jar, and wrap it up. In three hours the yoghurt is ready,” Stamen Tsvetkov, whose family won the prize for best sheep’s milk yoghurt in Tran, explained the preparation process. The thickness of the yoghurt depends on the animals and the grazing they get. Drier pastures make the yoghurt thicker than greener ones, while sheep and buffaloes give richer milk than cows and goats, he explained. 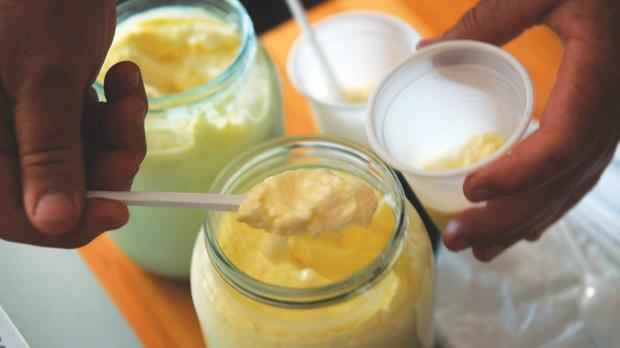 While villagers usually sell small amounts of their homemade yoghurt to friends and neighbours, many Bulgarian monasteries have also started to produce and sell traditional yoghurt. The Zhableno monastery in western Bulgaria prepares 750 kilos of its popular cow’s milk yoghurt a week and sells it in Sofia too. “Anyone who has tasted homemade yoghurt cannot get used to the industrially-made product stuffed with thickening and colouring substances,” said Fr Kliment, who is in charge of yoghurt production at the monastery. “True yoghurt cannot be anything but Bulgarian-made as the bacteria for its fermentation does not exist anywhere else but here,” he added. It was Stamen Grigorov, a medical student born in the Tran region, who discovered the Lactobacillus bulgaricus on studying the food habits in Bulgaria’s southern Rhodope mountains. LBB and another bacterium – Streptococcus thermophilus – are indispensable in the making of yoghurt, insists Julia Grigorova, the scientist’s grand-daughter. But the question of who made the first yoghurt and who introduced it to whom during Ottoman times remains a topic of heated debates between Bulgaria and Turkey, which are both fond of “ayran”, a refreshing beverage of yoghurt and cold water. For Zdravko Nikolov, laboratory chief at Bulgaria’s yoghurt institute LBBulgaricum, the answer is clear. “Bulgaria is the homeland of yoghurt as only here do Lactobacillus bulgaricus and Streptococcus thermophilus develop in symbiosis in nature,” he said. 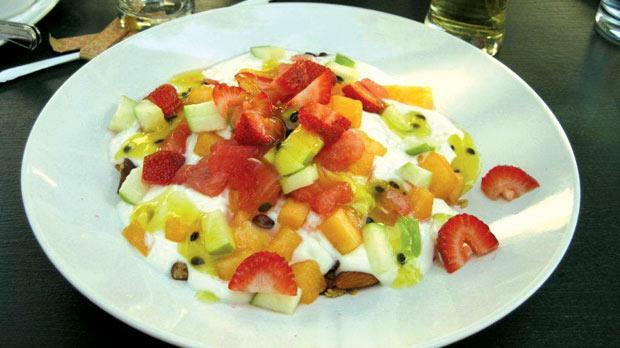 Bulgarians have 135,000 tons of yoghurt annually and the product is part of many traditional dishes.